The series of record-breaking events continues in Lebanon with a new record set by the Lebanese Red Cross association. 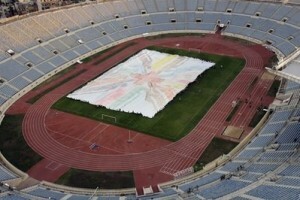 A 4,600-square-meter painted canvas was assembled at the Cite Sportive stadium in Beirut Sunday, breaking the Guinness world record for the largest handprint painting. The Lebanese Red Cross (LRC) broke the record by creating the Red Cross emblem using handprints collected from various Lebanese regions. The former holder of the world’s largest handprint painting was China, with a 3,715.86-square-meter canvas encouraging youths to combat drugs. Posted: November 1st, 2010 under Cultural, News.